Last night the undisputed leader of the poisonous Ron Paul invasion of the Minnesota Republican Party, Marianne Stebbins, was elected sixth alternate from SD 33 to the State Central Committee which meets on April 6th to select new party leadership, among other tasks. She may as well have not been elected at all. Alternates are just that and her last place position essentially means that assassins would have to take out all of the delegates and the five preceding alternates before she could cast a vote at that meeting. This is an amusing descent from her apotheosis at Tampa and the Republican National Convention last August. There she lead a delegation that was overwhelmingly in support of Ron Paul and voted accordingly. It was all for naught, of course, because Ron Paul wasn't going to win the nomination, just like he hadn't won anywhere else. Most Paulers are not in politics to win elections but an argument. I have taken up the helpful nomenclature of Nancy LaRoche (soon to be the next Chair of CD 5) who refers to builders and destroyers when looking at the infusion of people who came into local republican politics under the Ron Paul liberty banner. This keeps me, as I had done previously, from sweeping too broadly about them. Builders welcome. Destroyers must be destroyed. Destroyers delenda est. I'm not sure that this won't keep the local media and the laughable Prof. Larry R. Jacobs of the shopworn Humphrey School from putting Stebbins on their stale, tired programs or stale, tired panels. 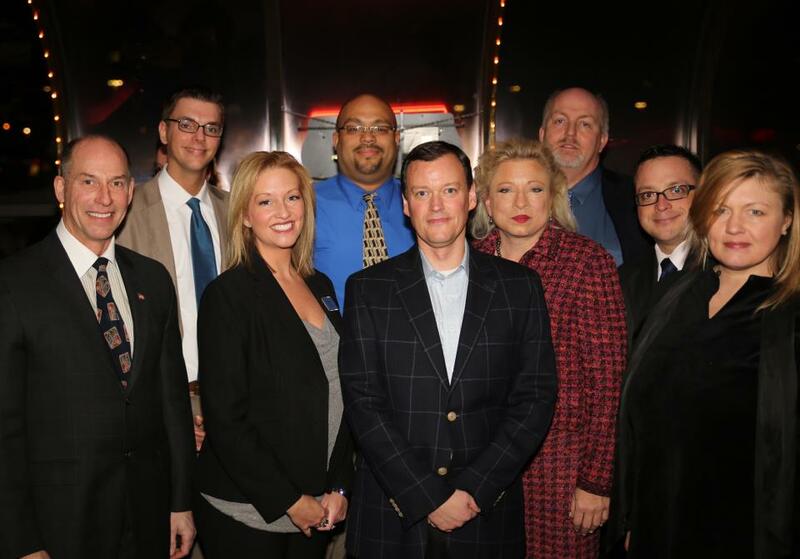 At some point, however, even these democrats with a byline will have to recognize that the future of the MN GOP does not, and never did, belong to this group of people. I don't fault them, actually, for including Stebbins but to position her in the manner they did was simply to hurt the overall image of the republican party. I'm not interested in appearing on these shows or panels (we're trying to attract not repel people) but I can give interested producers a dozen names of smart, savvy, hard working activists who know far more than Annette! Meeks or Andy Brehm or just about anyone else you see on those programs, Ben Golnik specifically excluded. We'll see if that happens. In the meantime, republicans who want to fight the awful overreach of a one party state should be gladdened by last night's denouement. Keith Downey seems very well positioned to become our party's next Chair, something I now welcome and about which more another time. I think he can reach out to all sorts of republicans, including the builders. Our choices for deputy chair are deeply disappointing and the current field is the best argument for abolishing the position altogether and saving money. The elimination of this position would only strengthen the role of executive director, something long overdue. In fact, without a deputy chair, we could pay someone who is very good (do we ever search for national talent or is Minnesota still too xenophobic?). We shouldn't duplicate the senate and house caucus example which simply hires leaderships' friends regardless of how good they are or how much they had a hand in losing the majority in each chamber. For a party that insists on measuring outcome, not intent, I'm always surprised by the junior varsity teams we deploy based purely on cronyism. To be sure, there are other reasons for our shocking lack of messaging which the fishbowls of caucuses seem worried about not at all. I've thought for some time Minnesota is in a post-party environment and that the DFL realized this long before republicans. The new chair will necessarily have to take this into account. The tasks are daunting but not insurmountable. Fortunately our Portlandia political opponents are doing their best to show normal Minnesotans just how out of touch and embarrassingly far left they really are at heart. Their relationship to unions is a classic example of the Stockholm Syndrome. Their overreach is necessary but not sufficient. In addition, the republican party's endorsement means virtually nothing (as opposed to being an outright kiss of death) given the Kurt Bills fiasco. The primary will be moved to June and republicans will select quality candidates who can win; not hot house flowers that wilt and die in the heat of political battle. The withering of the Ron Paul destroyers is a much needed and welcome sign that the worst of this hostile take-over is behind us. Yes, small skirmishes likely remain but the overall direction of the party back toward something voters would like to trust with a majority again has commenced. Republicans need to keep that momentum going by admitting our failures in the last cycle while providing principled opposition to one party rule during the current one. As always, the future is unwritten. Earlier today a profoundly misguided effort to monitor Minnesotans as so many serfs suffered what is likely to be a fatal reversal in the House of Representatives. 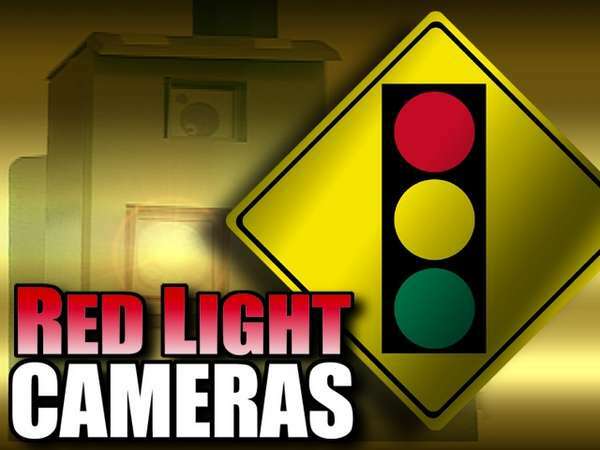 DFL Rep. Alice Hausman had introduced legislation that would have allowed cities to install cameras at intersections in order to catch drivers who run red lights. This Big Brother legislation was proffered in the name of all the usual good causes: safety, law and order, the children. Yes, it included the requisite sad parents who lost a child to a red light runner. This treacly sentimentalism has to stop; has to be called out. Mocked. Your loss doesn't trump my rights. A sentimental society is a sick society. The front group for this reduction in freedom was the adroitly named Traffic Safety Coalition. Who is against traffic safety? The bill was tabled after relentlessly negative testimony that followed supportive testimony which had any effect but that. These proceedings were well described on Twitter by Tom Scheck of MPR (@tomscheck) & Megan Boldt (@meganboldt) of the Pioneer Press, among others. The Hausman horror bill could still be resurrected but the smart money is that it will not. There is a senate companion bill that may or may not get a hearing. Disturbingly to me and other republicans, two GOP senators have authored that bill: Sen. Julie Rosen & her poodle Sen. John Pedersen. We have met the enemy and, not for the first time, it is us. I can cut Sen. Rosen some slack on the Vikings stadium give away of taxpayer dollars to millionaires. I can. But this craven, Stalinist imposition of cameras upon us makes her and Pedersen unfit for office. Clearly many democrats were against this legislation as well. It's enough to give one hope that all is not lost in this nanny state. Battle by battle; issue by issue. Why do the usual forces have to align in the usual manner? The short answer is that they do not. What struck me, however, in the reporting, is how superficial it was. I received an email from a member of the House trumpeting the merits of this Orwellian legislation. It was signed by a number of people from the Mayo Clinic. How were they bought? What interests of theirs were aligned with this specious legislation? You won't find any mention of it in the local press, of course. You can read that email by clicking here. Worse, the Traffic Safety Coalition is lazily termed by the Star Tribune as "a national non-profit." A non-profit! Lars Leafbladism™ strikes again. If it is a non-profit, only pure motives can obtain. A front group for a thug PR guy of Rahm Emanuel's Chicago? Why, who would suggest such a thing? I would; the facts as we know them would. Shortly after I received the cheerleading email for this legislation, I sent it to a number of extremely competent republican activists. Suffice it to say that we tweeted the results of what we found simply by using The Google. Could not, you know, alleged reporters do the same? Work backwards from the front group Traffic Safety Coalition to Redflex, the Australian company who bought four lobbyists (and apparently at least two GOP senators) to push the legislation, to Resolute Consulting, who "manages" the Traffic Safety Coalition non-profit! Who owns Resolute Consulting? Greg Goldner, a thug who has greased the skids for the loathsome, greasy Rahm Emanuel. Oh: Redflex got into a lot of trouble in Chicago, too. If you're too corrupt for Chicago, you set some kind of record. Redflex actually stopped trading its stock recently because of investigations into its affairs. Neumeister is not, to my knowledge, a republican. He is, I would say, our state's leading expert on or proponent of privacy in a digital age. Working with him was a watershed for me; perhaps my other fellow republicans as well. Put aside party labels, look at matters issue by issue. I have a feeling that this will not be the last time we will join forces with him in order to keep Minnesota from falling into the CCTV nightmare that has become the United Kingdom. To that extent, I would welcome support as they see fit from our friends on the DFL side of the aisle. Other privacy matters are, unfortunately, still in the legislative hopper. I promise to keep readers informed of them as far in advance as possible (Rich will always beat me to the punch so read him first!). In the meantime, you should follow those whom I have listed above in order to stay informed. That means you, too, Minnesota media. Then "report" on what you learned. We won't even ask you to give us credit. Servants to her family came into their presence on their knees. They exited the room backwards, still on their knees. Ono Yoko, as the Japanese would pronounce her name, was born into a world of wealth and privilege that mostly has not survived the modern age in that form and practically begs disbelief. Daughter of an enormously privileged banking family, Ono went to school with the future Japanese Emperor Akihito after their school reopened after World War II. Her family could see the Imperial Palace from the windows of their home. During that terrible war, she and her brother were sent into the countryside by their mother to escape the bombing of Tokyo. There she was humiliated and taunted for her social status by those with whom she needed to bargain to stay alive. Her mother is said to have run supplies to her in the countryside with which Ono bartered for survival for herself and her brother. After graduating in 1951, she was accepted into the philosophy program of Gakushuin, the first woman to be so accepted. She followed her family to America where she dismayed them by associating with people they thought were beneath her. She was undeterred. She had two marriages before Lennon, something most people don't know. She had a thriving art career (not to be confused with money) long before this mother-abandoned guy from Liverpool went to one of her art openings. She was a signature member of the Fluxus movement. She performed with John Coltrane during the creation of free jazz, no small feat. One of the few true things that Lennon said was, upon their marriage: "You'll always be Mrs. Lennon now. " Or words to that effect. Long after his death, Mrs. Lennon has continued to create and thrive. She's had something like 9 consecutive dance hits (I had to look that one up; bored New Yorkers have to go to some clubs, no?). She's had any number of art exhibits. She's still politically stupid: against fracking even though it is manifestly safe. The local protest movement will alway move her. Her tweets are rubbish and politically correct: they could be confused with those from the mayor of Minneapolis. Yet what I find when I say I like her music is mostly horror. I understand that. The avant garde Ono always pushed the sonic button, usually leaving beauty and harmony behind. The shrieking stuff comes from post Hiroshima. "It's OK Kyoko, Mummy's Only Looking For Her Hand In The Snow" is an actual song title of Ono's. Could you not scream? Still, a little bit goes a long way. Sean Ono Lennon is said to have said his mother is like Miles Davis. Uh, no. But there is a large body of work in which, though her range is thin, is on key and manages harmony in addition to the melody she wrote. Her lyrics are arresting. ("Once I was in love. It nearly killed me.") Why this aspect of her music is not more widely known is a mystery to me. The best I can recommend to readers is her album issued after John's death: "Season of Glass." If "Toyboat" doesn't move you, nothing will. Then again, it's hard to find now. Funny how that works. There is no more widely misunderstood, often hated, artist in the world than Yoko Ono. 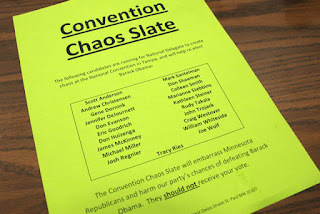 Got it, got it long before I received a standing ovation of boos at the MNGOP endorsing convention in May, 2012 for opposing the preeminent fraud, sick, twisted, Jew hating Ron Paul. The Weekly Standard called me "persona non grata" at that convention. Happy to take that to the grave. Today this fraud, now retired with God knows how much of a public pension, tweeted one of the truly most disgraceful tweets of all time. If you are not on Twitter (and if you're not I'm not sure you exist), it's the Wild West. Almost anything goes; thin skinned reporters and other fake sensitive types need not participate. But they do, to their detriment. Still, there was a collective gasp from the usually not dramatic Twitterverse today. It came in response to what was a wholly gratuitous tweet from L. Ron Paul. You'd have to be a low information voter, the type that reelected the most incompetent (but half black!) President in our history not to know of the death of Navy Seal Chris Kyle's death. Kyle was an exceptionally decorated hero who was a sniper specialist. Translation to the dope smokers in Mom's basement who totally are against the system: he killed the bad guys before they killed the good guys. "Chris Kyles' death seems to confirm that he who lives by the sword dies by the sword." I tweeted the F bomb in response; those who know me on Twitter know I rarely swear. Better language is always available and at a premium at 140 characters. Still, upon reflection tonight, I would not take it back or do over. The online information reaching back decades about this charlatan was available to anyone with an internet connection. This is the real Ron Paul. A lazy, stoner's Noam Chomsky, if they can even manage that quisling's name. Neo-hippies. How then, did so much of the Minnesota Republican establishment either get co-opted or silenced by these ignorant forces? Where was Keith Downey condemning these remarks? Marianne Stebbins, the Eva Braun of the movement? The faux republican Paulers who, it seems now, want to be seen as "builders" in contradistinction to "destroyers," were nowhere to be seen condemning Paul's slander against noble military service. Their silence, collective and individual, constitutes an enormous black mark, shame, on the Republican Party of Minnesota. Not as dark, of course, as Keith Ellison traveling on the taxpayers' dime to barbaric, hellish Saudi Arabia, which beheads female Sri Lankan maids without a lawyer or due process after being in the country for a week or two on the trumped up accusation of killing her infant charge. Wouldn't patchouli Susan Hogan usually be outraged on behalf of such women (now murdered), even those who don't dismember their unborn in the name of the oh so happy lives so exactingly showcased on HBO's "Girls?" In the meantime, I tire of my own role as the Ron Paul Cassandra. 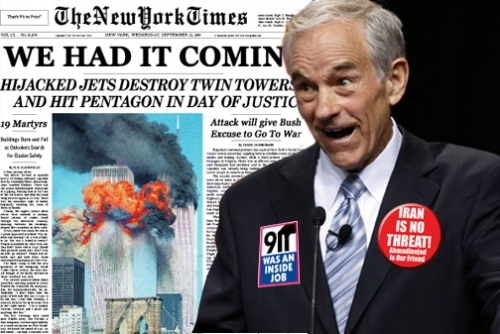 With L. Ron Paul's shameful tweet today, you either have figured it out or you have not. And if you're the latter, I'm with my friend Andy Parrish: get your own party. 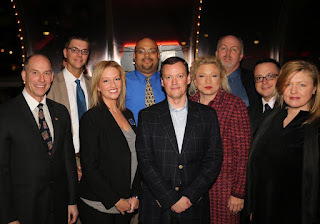 Last Wednesday night a self selected group of far right types, some masquerading as republicans, gathered unto themselves at a hideous suburb (redundant, I know) watering hole called The Blue Fox in Arden Hills. The name and location alone should have been enough to put off right thinking conservatives. But no, because this wasn't a gathering called for by republicans or, mostly, attended by them. It happened nonetheless and it happened for the worse to the extent the public saw this as being under the imprimatur of the Minnesota Republican Party. Nothing, of course, could have been further from the truth. It just looked that way. There is something to be said for absenting oneself, from politics or love. Self preservation is always a worthy goal. To an extent. The photo above constitutes the panelists, the moderators and the single organizer: left to right, Dan Severson, Steve Hensley (the organizer), Erin Haust, Walter Hudson, Jeff "Get Over it" Johnson, Sarah "Follow The Gambling Money" Janacek, Mitch Berg, Andy Parrish, Marianne Stebbins. This is not the face of the republican party in Minnesota but one would be hard pressed to disprove it by the advance publicity, the attendance and the subsequent reportage. As one who (almost singularly at times) has called Minnesota media to task, I cringed as I attended this fiasco to think of their stories: hopefully words would fail them to describe just how awful it was. I could probably out write most of them but never, ever Bill Salisbury of the Pioneer Press. I'm late to the game, know enough to make me dangerous, but Salisbury reminds me of my coming of age: the press you could trust. Long gone, those days. But there he was, at the end of the bar, taking notes in longhand. Meanwhile on Twitter, an exceptionally thin skinned, ferociously untalented "reporter" wondered if the panel liked her. I checked my impulse to throw up. Some of my peers sucked up to her. Get me rewrite. Throwing up was a good thing because what I heard could warrant it. I sat far away, made certain not to run into that tapeworm known as Keith Downey (seriously? I have to set my leadership standards *this* low? No thanks) and sat far from the maddn crowd. Mad it remained, though. Everything that was wrong with the republican party was on excruciating display that night. I'm expected to provide the autopsy.